The Saturday following Diwali was Bhai-Duj. My sister was ecstatic — it has been about ten years that I haven’t been with her on this occasion. We did the usual ritual in our hotel room at Mangalore. Custom dictates that we both eat something sweet afterwards. To our dismay, even at nine O’clock, no shops were open. After roaming around in Bunder area for ten minutes, we managed to buy some Eclairs. We had to get back to PVS circle in order to catch a bus to Udupi. Local buses are pretty cheap. Some sixty-odd rupees and two hours later, we were at our destination. 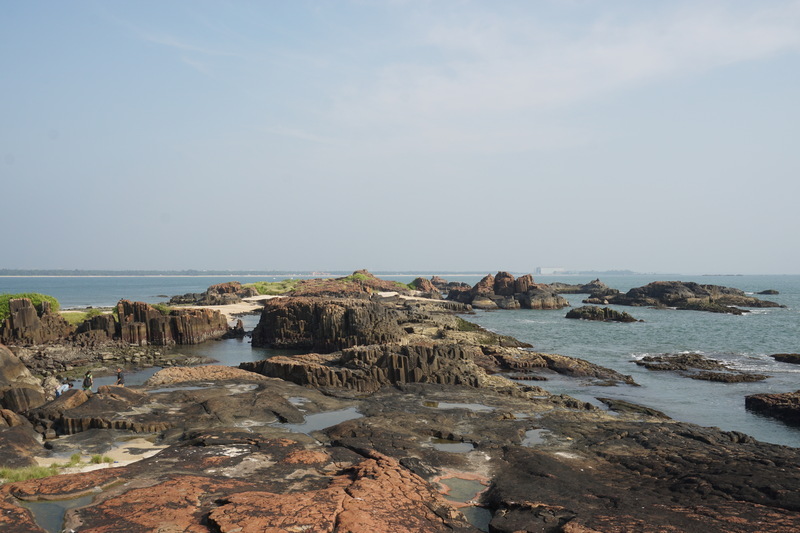 A quick check showed that there wasn’t much to do at Udupi. Two whole days in Udupi would have been a waste of time. Our bus wasn’t scheduled until the following night. I had a chat with the travel desk of our hotel (Sri Krishna Residency) and decided to book an outstation cab for the next day. 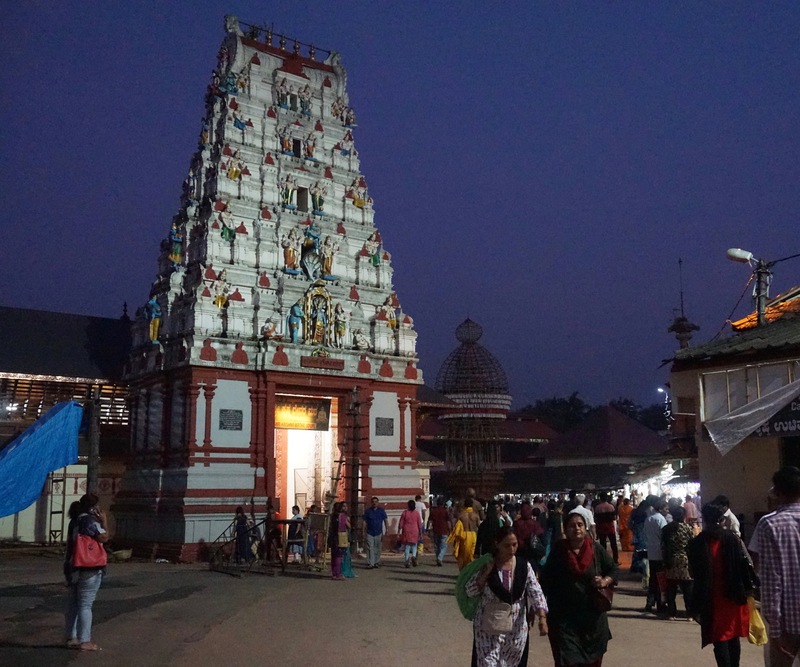 I had the entire afternoon and night to visit the two places in Udupi — St. Mary’s Island and Krishna Temple. St. Mary’s Island closes by 5:00 pm. 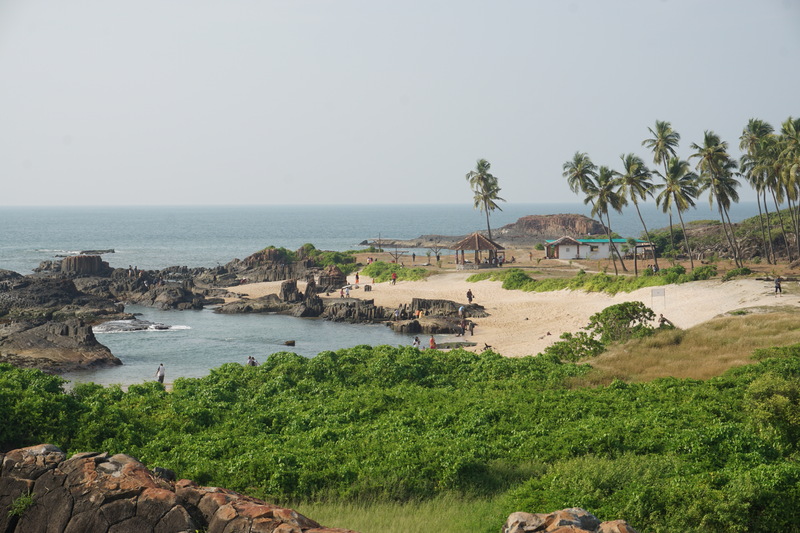 In order to go there, one has to take a ferry from Malpe beach, which itself is about eight kilometres from the city. The last ferry from Malpe beach leaves at 4:30 pm. The booking guy had a very dry sense of humour. It was almost as if his mood was oscillating around the boundaries of irritability. 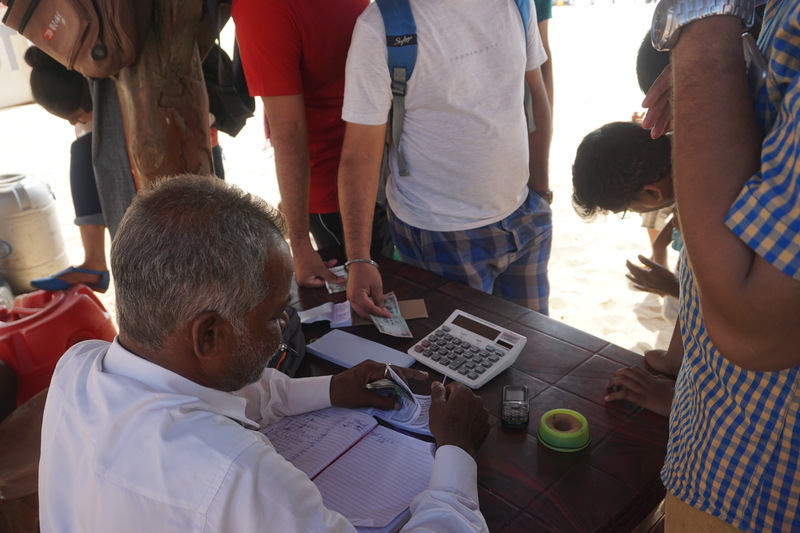 For three-hundred rupees per person, one can cross a bit of the ocean and reach the island. 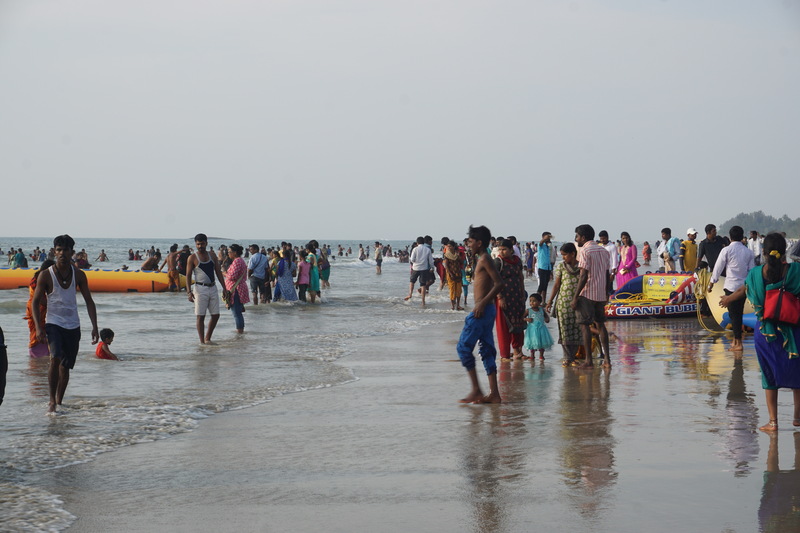 Malpe beach was quite crowded owing to the long weekend. Once we were on the other side, the ferry operator insisted on getting back in an hour. Since we were there by 3:30 pm, we had ample time to walk around the island. 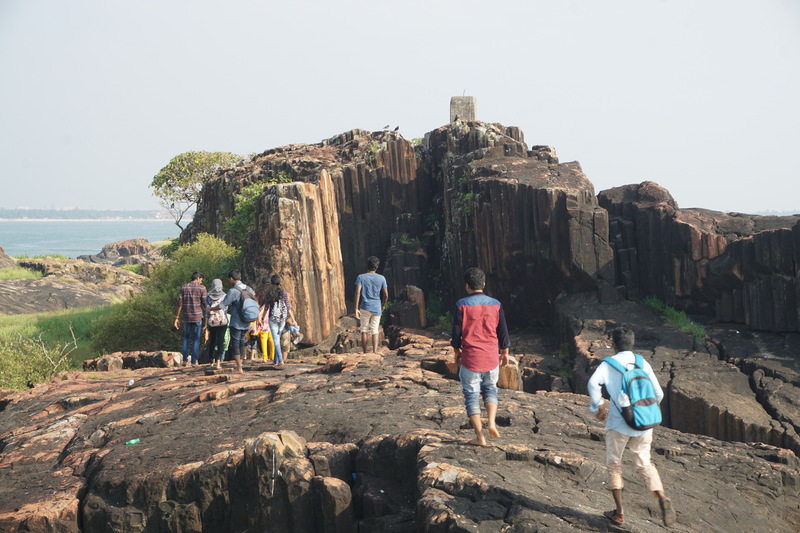 The entire island is made of columnar basaltic lava (my geologist cousin explained that to me) and in parts covered by thick blanket of shells. We walked over the mounds and the shells while clicking photographs. My sister, who has been trying to get fitter, understood the need for doing so when she had to scale the rocks to reach the highest point of the island. With some help from a few strangers, she managed to get on top. The concrete marker is the highest point of the island. The northern and central part of the island. There is also has a small shop from where we had some fresh lime soda. The columnar lava rocks are clearly seen here. After spending another afternoon at another beach, we were back at our hotel by evening. Following a change of clothes, we ventured out to the Sri Krishna Temple complex, which happened to be right behind our hotel. It is a nice place to spend some time. The entire complex is accessible only via foot. There wasn’t much crowd either, which made our visit a bit more enjoyable. There is a small pond inside the temple. The complex has many shops that cater to the daily needs of residents. There are a couple of eateries as well as few roadside fast-food vendors. My sister bought a South Indian style filter for making coffee from one of the steel and brassware shops. For our dinner we went to a restaurant called Woodlands. 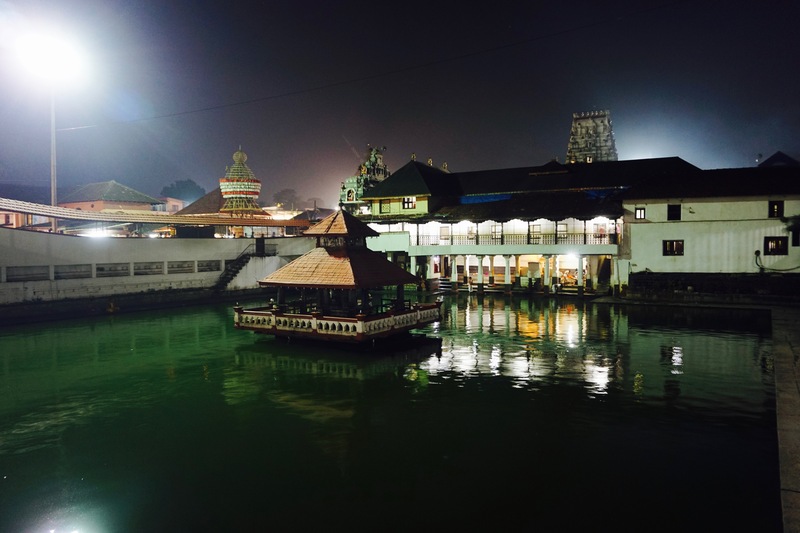 It’s adjacent to the temple complex. I opted for a South Indian thali while my mom and sister settled for North Indian thalis. Their thalis were pretty good although we had some trouble finishing the entire amount of serving. We liked the food so much that we returned for our dinner the next day before boarding the bus. Note: This blog entry documents our trip on October 21, 2017.